(CNN) - A new poll shows U.S. Ambassador to China Jon Huntsman might face some obstacles in Utah if he decides to launch a bid for the White House. In a hypothetical presidential match-up between the former Utah governor and former Massachusetts Gov. Mitt Romney, 56 percent of Utahans would cast their ballot for Romney and 26 percent would choose Huntsman, according to the Deseret News/KSL poll released Saturday. 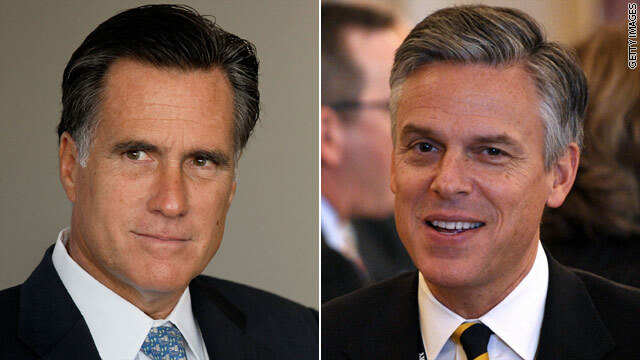 Among Republicans, Huntsman's support drops to 15 percent compared with Romney's 72 percent. Utah's GOP primaries are closed to non-Republicans. Romney, who will likely run for the GOP nomination in 2012, is a graduate of Utah's Brigham Young University and headed up the 2002 Winter Olympics in Salt Lake City. He won the 2008 Utah Republican presidential primary with 90 percent of the vote, before eventually losing the nomination to Arizona Sen. John McCain. Huntsman resigned during his second term as governor of the Beehive state to serve as President Obama's ambassador to China in 2009, a position he will leave at the end of April amid speculation he will seek the Republican nomination in 2012. Both men are members of the Church of Jesus Christ of Latter-day Saints, which constitutes a key voting bloc in the state. The poll of 496 residents was conducted between February 8 and 10, and has a margin of error of plus or minus 4.4 percentage points. Everybody and their dog is running for the WH. They all have the answers, but only blowing smoke. Based on this poll, it is obvious that Utahans are excited about government Romney care. Both men have similar weaknesses being Mormons and moderates. They may not be acceptable in the Southern Baptist Bible belt and to extreme conservaties/Tea Party members. Search the Internet for "Mormons evangelical Christians" and you'll see why neither of these guys would ever be nominated as the Republican presidential candidate. Romney may be the only candidate to get Independent and Democrat votes, the rest are just out there making a lot of noise about nothing. Where are all these wannabe's coming from? All of these Republikans cannot possibly believe they are qualified, or have a snowball's chance of becoming president. Some of these folks are indeed decent people, that are clearly qualified as Governor or Congressman in their own little backwater. But almost NONE of them have what it takes be president. And what is this garbage about Trump running or considering it? The serial adulterer believes he is ready to live in the White House? If these are the best candidates they have, President Obama has nothing to worry about. Ron Paul won a straw poll and everyone is in 7th heaven. Get real folks because Ron Paul will be 77 years old in 2012. Remember how everyone complained about Mc Cain being too old at 73? Romney is LDS royalty, Huntsman is not. Romney's family have been in the LDS hierarchy for generations, and his uncle served as in the First Presidency under Gordon Hinckley. Also, the love of the almighty dollar that many LDS openly pursue ( as seen by the high percentage of business grads from BYU and other universities and colleges) leads me to conclude that Huntsman is toast. Also, if there is so much as a tacit nod of approval by the LDS leaders towards Romney, the majority of Church members will blindly follow suit. Huntsman also suffers from the additional handicap of having worked for Obama, and no other religion in the country has so openly opposed Obama as the LDS have: anyone associated with the Obama adminstration has become an object of contempt, ie, Senators Reid or Udall.